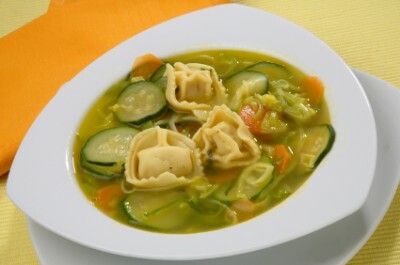 Warm This quick Tortellini and Zucchini Soup is a meal in itself. It’s simple to make and nutritious to eat. 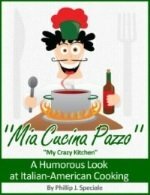 Regardless of the tortellini this dish is still a low fat meal. There is roughly 8 grams of fat per serving. Tortellini stuffed with cheese and spinach works very well with this dish. They turn this regular vegetable soup into a hearty meal. Mini raviolis can also be used for this dish. There’s nothing better than this Tortellini and Zucchini Soup on a cool fall evening. Serve it with some whole grain bread and a spinach or arugula salad and your all set for the evening. Add the onions, carrots, celery, garlic and rosemary and sauté for 3 minutes. Pour in the vegetable broth and bring to a boil. Reduce to a simmer and add the zucchini and tomatoes. Add the tortellini and season with salt and pepper. Cook the soup for about 30 to 40 minutes.